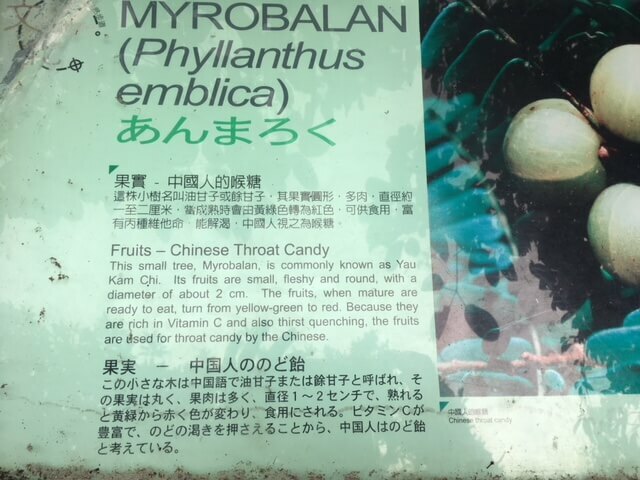 HF: While walking up Hatton Road above the University of Hong Kong, on The Peak on Monday 22nd January 2018, I came across the signs below about the Myrobalan tree, also known as Emblic and Yau Kam Chi or Phyllanthus emblica (Euphorbiaceae). This can be added to our small but growing list of HK trees that were traditionally used to produce a variety of products. In this case firstly, Chinese throat candy. The sign says “This small tree, Myrobalan, is commonly known as Yau Kam Chi. Its fruits are small, fleshy and round with a diameter of about 2 cm. The fruits, when mature are ready to eat, turn from yellow-green to red. Because they are rich in Vitamin C and also thirst quenching, the fruits are used for throat candy by the Chinese. But the trees have,or had, a more intriguing use. The second sign subtitled Leaves – Summer Pillows, continues, “The leaves of Myrobalan are less hygroscopic than cotton, meaning they absorb less water from the atmosphere. 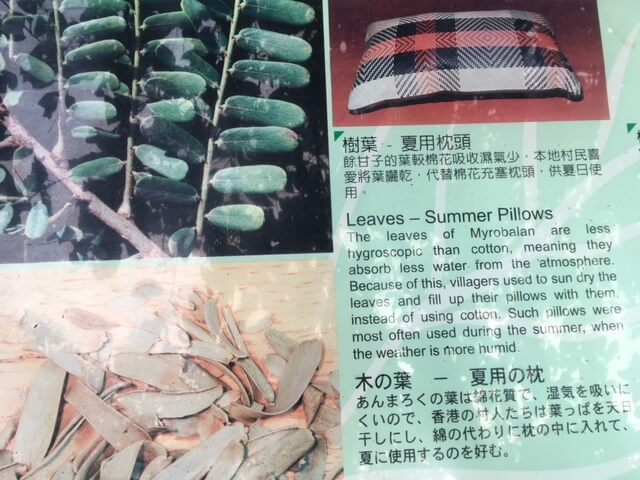 Because of this, villagers used to sun dry the leaves and fill up their pillows with them instead of cotton. Such pillows were most often used during the summer, when the weather is more humid.” My wife says she has seen examples of the pillow seen in the image below in shops that sell traditional bedding products. Are the Myrobalan pillows still being produced here in Hong Kong or China? This article was first posted on 24th January 2018. Yes, you just answered a question for me! I don’t know about actual pillows, but I saw bags of the leaf for sale in Kowloon City last weekend and had no idea what they were. My friend asked the staff and they said for stuffing a pillow. Now I want to try a pillow stuffed with it!